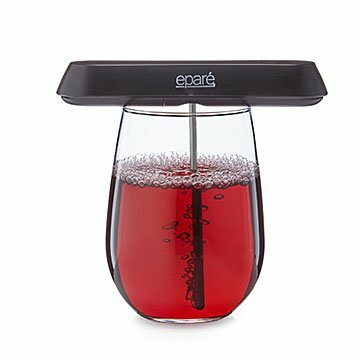 Take this pocket-sized aerator on the go to enjoy red, white, or port to its fullest. Somewhere between sommelier and college student, you thoroughly enjoy a good glass of wine. Perhaps you even know the purpose of swirling: to aerate and bring out its diverse flavor profile. But what if you could strengthen the results of your approach in as little as 15 seconds? With the push of a button, this pocket sized aerator creates tiny bubbles to free a more enriching aroma and flavor. Forget the "one-twirl-fits-all" mentality—this trusty gadget has three specific settings for red, wine, and port. Stow it in your overnight bag or in-pocket to enjoy a better sipping experience on demand. Made in China. Rinse the aerating rod in warm soapy water prior to storage. I have done blind taste tests with many of my friends and they have been able to tell the difference every time. Quick, easy, and works! I use it at home and bring it in my purse all the time! I bought this for my mom for Christmas. I'm returning it. It doesn't work very well. Lets out a very small trickle of bubbles and doesn't truly aerate the wine. I pack it in my travel bag...now ill always be able to enhance my wine! !